Laurent L, Mårell A, Balandier P, Holveck H, Saïd S (2017). Understory vegetation dynamics and tree regeneration as affected by deer herbivory in temperate hardwood forests. iForest 10: 837-844. Plant competition and deer browsing are two main factors which limit tree recruitment. We examined natural tree-recruitment processes under continuous-tree-cover management. Changes in plant communities and tree regeneration were monitored over an eight-year period at two different sites in a temperate hardwood forest in the North-East of France. We used paired control plot (unfenced areas, free access to deer) and exclosures (fenced areas, excluding deer) at both sites. Shade-tolerant browsing-tolerant opportunistic species (beech, Fagus sylvatica at site 1 and bramble, Rubus spp. at site 2) were present in low numbers at the beginning of the study. We found that these species used a sit-and-wait strategy, waiting for opportunities to proliferate (thinning and deer exclusion). In the exclosure at site 1, beech proliferate slowly. In the exclosure at site 2, bramble proliferated enough during the first two growing seasons to prevent tree recruitment. 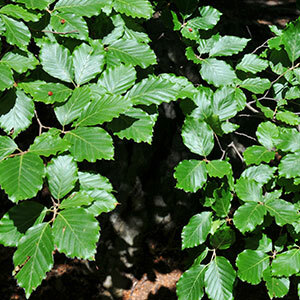 Thus, fencing encouraged beech sapling or bramble growth, and this growth in turn was detrimental to the richness and diversity of the plant community. The two study cases presented show that both plant competition and deer browsing can be problematic for tree recruitment. Our results further suggest that excluding deer is not sufficient to enhance the growth of browse-sensitive and moderately shade-tolerant tree species such as oaks (Quercus petraea and Q. robur). European ungulates and their management in the 21st century. Cambridge University Press, New York, USA, pp. 604. Designing forest vegetation management strategies based on the mechanisms and dynamics of crop tree competition by neighbouring vegetation. Forestry 79: 3-27. Architecture, cover and light interception by bramble (Rubus fruticosus): a common understorey weed in temperate forests. Forestry 86: 39-46. Introduced deer at low densities do not inhibit the regeneration of a dominant tree. Forest Ecology and Management 364: 70-76. Effects of roe deer browsing and site preparation on performance of planted broadleaved and conifer seedlings when using temporary fences. Scandinavian Journal of Forest Research 24: 308-317. Modelling understorey light for seedling regeneration in continuous cover forestry canopies. Forestry 84: 397-409. Plant sociology. The study of plant communities. McGraw-Hill Book Co. Inc., New York and London, pp. 476. Survival, growth, and photosynthesis of tree seedlings competing with herbaceous vegetation along a water-light-nitrogen gradient. Plant Ecology 145: 341-350. Tree regeneration and plant species diversity responses to vegetation control following a major windthrow in mixed broadleaved stands. European Journal of Forest Research 130 (1): 41-53. Seasonal variations of red deer selectivity on a mixed forest edge. Animal Research 54: 369-381. Multiple comparisons using rank sums. Technometrics 6: 241-252. On the combination of species cover values from different vegetation layers. Applied Vegetation Science 18: 169-170. Drought affects the competitive interactions between Fagus sylvatica seedlings and an early successional species, Rubus fruticosus: responses of growth, water status and δ13C composition. New Phytologist 151: 427-435. Effects of drought on the competitive interference of an early successional species (Rubus fruticosus) on Fagus sylvatica L. seedlings: 15N uptake and partitioning, responses of amino acids and other N compounds. Plant Biology 4: 311-320. Are abundance indices derived from spotlight counts reliable to monitor red deer Cervus elaphus populations? Wildlife Biology 16: 77-84. The impact of deer on woodlands: the effects of browsing and seed dispersal on vegetation structure and composition. Forestry 74: 209-218. Fruit fate, seed germination and growth of an invasive vine-an experimental test of “sit and wait” strategy. Biological Invasions 3: 363-372. Development of Quercus robur advance regeneration following canopy reduction in an oak woodland. Forestry 80: 137-149. Old-growth forest floor richness increases with red deer herbivory intensity. Forest Ecology and Management 310: 267-274. Pseudoreplication and the design of ecological field experiments. Ecological Monographs 54: 187-211. The impact of deer on the ground flora of British broadleaved woodland. Forestry 74: 219-229. Regeneration of mixed deciduous forest in a Dutch forest-heathland, following a reduction of ungulate densities. Biological Conservation 105: 65-74. Exclosures can favour natural regeneration of oak after conservation-oriented thinning in mixed forests in Sweden: a 10-year study. Forest Ecology and Management 354: 1-9. Effect of deer browsing on timber production in Allegheny hardwood forests of northwestern Pennsylvania. Research Paper NE-475, USDA Forest Service, Washington, USA, pp. 10. Importance of alternative food resources for browsing by roe deer on deciduous trees: the role of food availability and species quality. Forest Ecology and Management 226: 248-255. “vegan”: community Ecology Package. R package version 2: 3-3, web site. The impact of roe deer (Capreolus capreolus), seedbed, light and seed fall on natural beech (Fagus sylvatica) regeneration. Forest Ecology and Management 255: 3962-3972. The measurement of diversity in different types of biological collections. Journal of Theoretical Biology 13: 131-144. A review of the history, definitions and methods of continuous cover forestry with special attention to afforestation and restocking. Forestry 77: 27-44. Deer impacts on forest ecosystems: a North American perspective. Forestry 74: 201-208. Close-to-nature silviculture: is this concept compatible with species diversity? Forestry 72: 359-366. Deer prevent western redcedar (Thuya plicata) regeneration in old-growth forests of Haida Gwaii: is there a potential for recovery? Forest Ecology and Management 255: 3973-3979. Kilometric index as biological indicator for monitoring forest roe deer populations. Acta Theriologica 36: 315-328.